Refuting Ehrman with objective evidence predicted in scripture by prophets. Textual criticism is dealt with in this book with the help of Dr Mark D. Roberts, Harvard Educated Theologian. From there the author, Chris Queen, a mechanical engineer (BSME) lays out from the specific timelines in the Bible and the simple math in God's finally revealed word problems unsealed, as the angel promised Daniel in the "time of the end." The book provides concrete evidence tracing some predictions from two directions in both Daniel and Revelation arriving from both books at the same point in history on the same clearly predicted event. The evidence would stand up as fact in a court of law. Dare you! 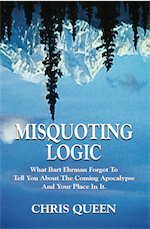 A must read for parents and grandparents looking for ways to immunize children and grandchildren from the foolishness now being taught as fact and doubts created by those such as Bart Ehrman and his ilk. A must read for those wanting better understanding of the relationship between the Old Testament and the New Testament as well the Old Covenant from Moses and the new covenant in Jesus who has revealed the Father and set aside the penalty required in God's holiness and justice by the cross. If there was a book that told history in advance in very specific detail including the destruction and rebirth of a nation 2500 years later giving the specific date through several sources therein and verified by recorded history, archeology, also predicting the retaking of their capital and return as a fruitful nation there outnumbered in a war zone with hostile neighbors trying to destroy them and also a prediction that a group called the church built around Jesus and twelve disciples would one day, as he predicted spread through the beginning with the first century witness to the far ends of the earth, also predicting a coming end of the earth and time would we believe it? The Bible is that book, as the author irrefutable reveals. A must read for those wanting to discover the new life in Jesus offered by God through his indwelling Holy Spirit. "Blessed are they who are called to the wedding supper of the Lamb." "COME!" Chris Queen. Isaac Newton proved, by deriving Calculus, the mechanics of the universe from observation. The force of gravity is proven, from observation and described mathematically from Newton's Laws. Proofs from scripture (fifth grade level word problems ...easy) provide objective evidence the Ancient of Days has spoken and boasts in Isaiah 46: 8-13. Perhaps the most important book of our times. Author Chris Queen obliterates Ehrman, as well as Hitchens, Dawkins and all the rest with his laying out of numerous very specific and detailed fulfilled prophecies objectively proving God tells world history, thousands of years in advance per prophets as he boasts.